Members of the Life Runners group pose by the Rocky statue at the Philadelphia Museum of Art during the weekend's races at the Philadelphia Marathon Nov. 19-20. Runners who took part in events of the 62nd annual Philadelphia Marathon Nov. 19-20, and the thousands of spectators who cheered them on, would have noticed a group of runners wearing blue t-shirts with a special message. 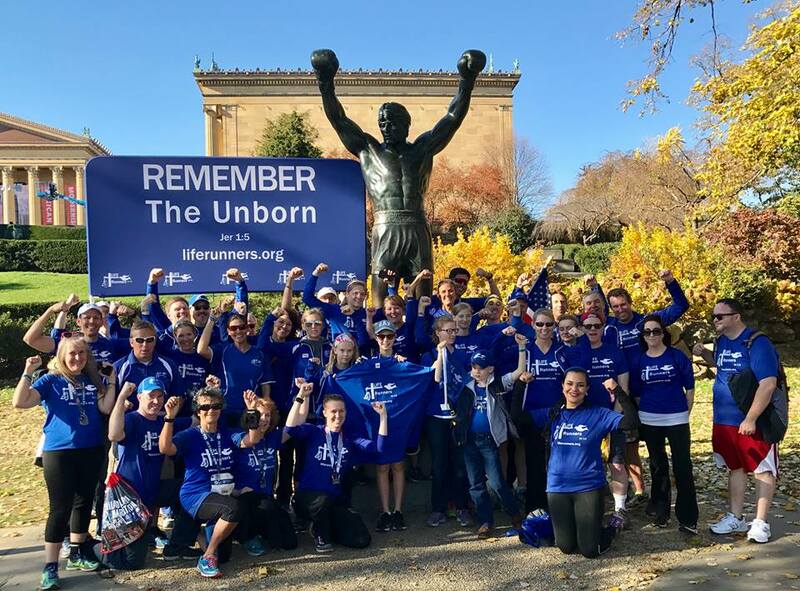 A call to “Remember the Unborn” along with a biblical reference of Jeremiah 1:5 (“Before I formed you in the womb I knew you, before you were born I dedicated you, a prophet to the nations I appointed you.”) blazoned the shirts of the Life Runners. The group of 75 runners — 15 running in the full 26.2-mile race, 10 in the 8K, and 50 in the 13.1-mile half-marathon — took part in the weekend’s festivities. The group began in 2008 with the Chicago Marathon and with the expansion to Philadelphia last year, they now boast representatives from all 50 states. Group founder Pat Castle, a retired Air Force colonel from Colorado Springs, Colorado, said the runners’ trip to Philadelphia is their largest gathering ever. One of the local runners was Ted Mirenda of St. Peter Parish in West Brandywine, Chester County, who began Philadelphia’s Life Runners chapter last April. The Beamer family from Canistota, South Dakota was one of the families who made their first trek to Philadelphia. Grace, 19, competed in the 8K, and she finished second place out of the 75 runners in her age category. “Being a witness is just amazing,” she said. Not only were there families of four, five or six, but a sibling combination in Mark and Denise Espinoza from San Antonio, Texas also made the trek to Philadelphia for the first time. Mark ran the half-marathon while Denise ran the 8K on Saturday. Bishop Thomas Paprocki of Springfield, Illinois crosses the finish line of the Philadelphia half-marathon Saturday, Nov. 19. He celebrated Mass Saturday evening after running in his 22nd marathon. Not only were there families in the group but also some clergy took part in the races. One of them was Bishop Thomas Paprocki of Springfield, Illinois. 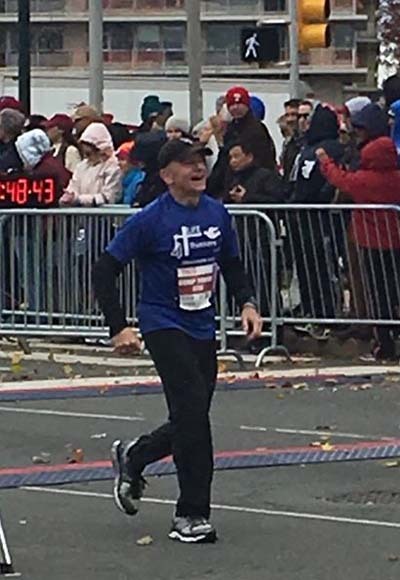 The group’s chaplain and a seasoned marathon runner, Bishop Paprocki ran in his 22nd marathon in as many years with the group last weekend. He also celebrated the Saturday evening vigil Mass of Christ the King at the Cathedral Basilica of SS. Peter and Paul. Despite the chilly fall Sunday morning, Bishop Paprocki ran the marathon and finished with a time of four hours and 30 minutes. Philadelphia priest and U.S. Navy chaplain Father Joseph Coffey, currently stationed in San Diego, also ran in the race and made it a homecoming weekend with a visit to his native Bala Cynwyd. “I have been waiting three years for this moment,” said Father Coffey. Having runners young and old and Bishop Paprocki run with him in Philadelphia was an “inspiration to me. They are a witness and gift to many,” Father Coffey said. Mirenda hopes other area runners will join the Philadelphia chapter by visiting the LifeRunners.com website.